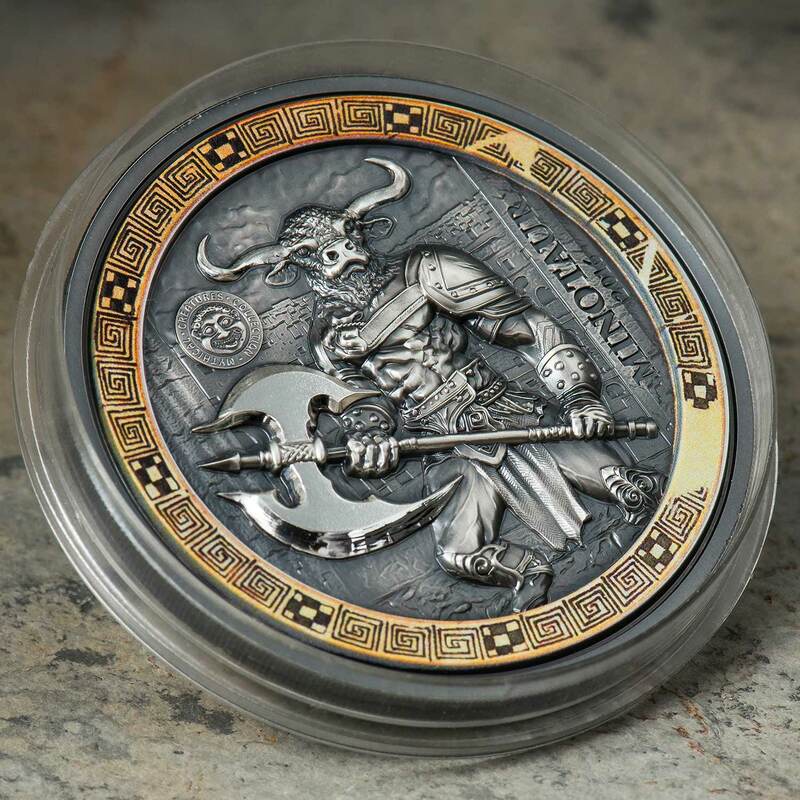 One of the premiere mythology series on the market today, and one of the first, Mythical Creatures is an annual coin series from German producer Numiartis in conjunction with industry legends, Coin Invest Trust. 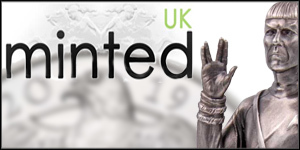 The first coin debuted to much acclaim in late 2013 and featured the Werewolf. Struck in two ounces of fine silver, the signature element of this one was a moon insert made from a piece of white marble. The following year saw a Vampire coin with a bat formed from black marble and that was itself followed by a Medusa coin last year. 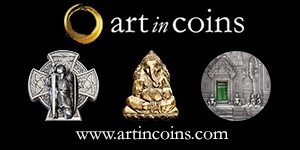 This fourth coin has moved away from a marble insert for the first time, instead choosing to go with a classic ultra high-relief strike and employing CIT’s ground-breaking SmartMinting techniques. 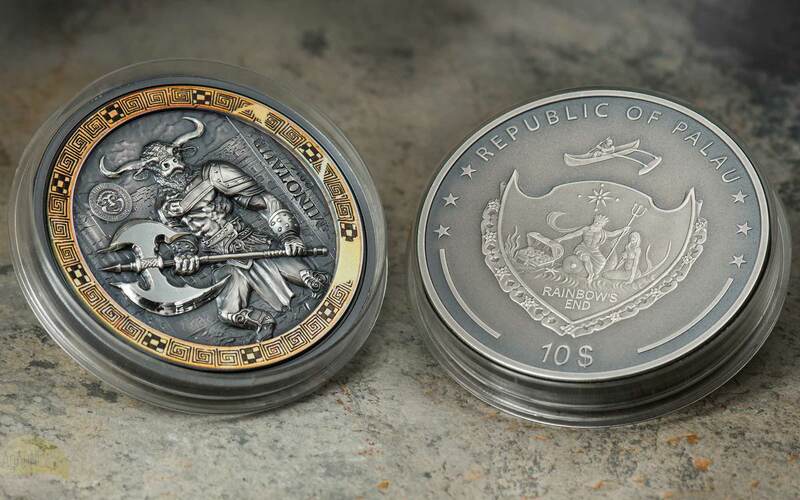 The end result is a powerful looking coin, depicting a muscled Minotaur holding a double-headed axe and standing in the famous labyrinth. The strike seems to display an extraordinary amount of dimensionality, enhanced by a gilded and patterned ring surrounding it. The date (2016) and title (MINOTAUR) are inscribed on this face, along with a small series graphic that’s been present since the beginning. 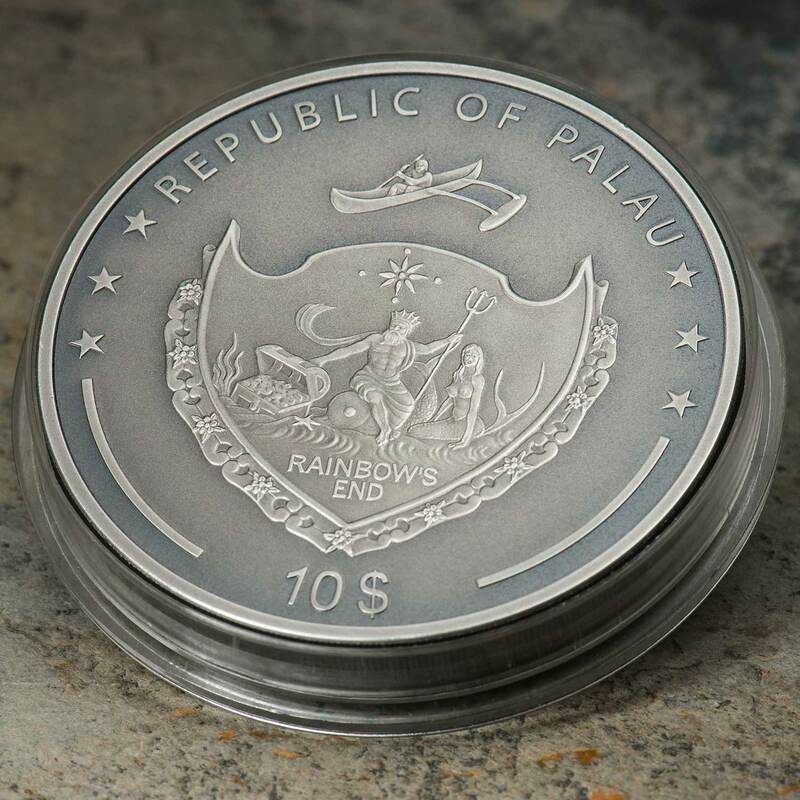 Issued for the West Pacific island nation of Palau, the obverse carries their attractive shield emblem along with the rest of the expected coin inscriptions. 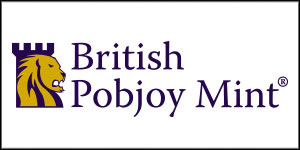 A fine quality windowed coin box holds this impressive new issue and that, along with a certificate of authenticity, sits inside a themed outer shipper. If last years issue is any indicator, we’d expect this to be in the €250-300 range when it goes up for pre-order shortly. Shipping should begin in November, just in time for the holidays. Like before, just 999 of these will be struck. With this and the Mint of Poland’s excellent minotaur release, collectors have a fine choice of design from which to pick. 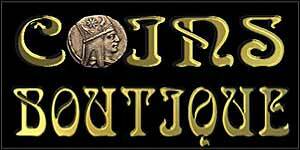 If you want this coin, keep an eye on the usual places and Intercoins-Berlin, the sister company of Numiartis who will of course, stock the coin. Minos was one of the three sons from the union of Europa and Zeus; when Zeus took the form of a bull. Europa’s husband was the King of Crete, Asterion, who looked over the boys as if they were his own. When Aseterion died, it was unclear which of the three sons should ascend to power. Minos claimed that he had the support and authority from the gods to rule and to prove it, while sacrificing to Poseidon, he prayed that a bull would appear from the depths of the sea. Minos vowed to heaven that he would sacrifice the bull to Poseidon once it appeared and a magnificent bull did appear. Minos became king and banished his two brothers. King Minos did not fulfill his vow to Poseidon; he kept the majestic bull for himself and sacrificed a different one to the god. Angered by the disrespect, Poseidon punished Minos by instilling a passion within the king’s wife, Pasiphae, for the bull. Queen Pasiphae, plagued by her divinely inflicted desires, sought the help of Daedalus and Icarus. For Pasiphae, Daedalus constructed a wooden cow coated with a real cow hide and placed it upon wheels. Daedalus, then, put Queen Pasiphae inside the structure and wheeled her into the meadow that her beloved bull grazed in. It was there that she met and laid with the bull, since the bull thought the wooden cow was real. 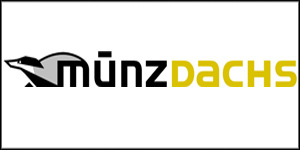 It is from this union that the Minotaur was born. The queen named the beast Asterion and he became ferocious and monstrous. Asterion was unable to find a suitable source of food and so he started to eat people. In order to hide his wife’s disgraceful affair and on the advise of an Oracle, King Minos commanded Daedalus and Icarus to build a grand Labyrinth to house his wife’s son. While the construction of the Labyrinth was underway, King Minos discovered that his only human son, Androgeos had been killed and he blamed the Athenians. He sailed against the Athenians and harassed them until they agreed to pay a tribute to Crete of seven maidens and seven youths every nine years. Theseus, son of the Athenian King Aegeus, was said to have volunteered for the third tribute of youths and boasted to his father and to all of Athens that he would slay the Minotaur. He promised that on the journey home he would raise his white sails if he was victorious or have the crew fly black sails if he failed and was killed. Upon reaching Crete, the daughters of King Minos: Ariadne and Phaedra fell deeply in love with him. Unable to cope with Theseus being eaten by her half-brother the Minotaur, Ariadne went to Daedalus for help. Following Daedalus’ instructions, she handed Theseus a ball of string to help him find his way out of the Labyrinth. Upon entering the Labyrinth, Theseus tied one end of the string to the door and continued into the maze. He found the Minotaur in the furthest corner of the Labyrinth and killed him with jabs of his fist. After, Theseus simply follows the thread back through the maze to find his way to the doors. He finds and leads the other Athenians out of the maze and quickly sails off to Athens with Ariadne and Phaedra. On the journey home, Theseus abandons Ariadne on the island of Naxos and continues to sail to Athens with his intended wife, Phaedra. Theseus is overjoyed to be almost home but forgets to change the color of his sails from black to white. His father, King Aegeus, seeing the black sails from afar is overcome with grief and kills himself by jumping off a cliff into the sea. It is this act which secures Theseus’ place as the new Athenian king and explains the origin name of the Aegean Sea.